Then there is the unexpected, as there was in 2018: the opening of a door in a church in Oxford on January 24th—when I was already in my long gown and high heels, carrying tons of stuff in my arms (including the hot water bottle to keep me warm). There was no warning that there were immediately three steps on the other side of that door. Down I went. I will never forget the awful pain in my left foot. True to form, I went on with the concert an hour later, being wheeled out to the platform in a wheelchair, and lifted up to the piano by two guys from Canada’s National Film Board who were filming me that day. The presenters had said next to nothing about my accident in their pre-concert remarks. People were shocked to see me unable to walk. But I played all of Bach’s Well-Tempered Clavier over the next two and a half hours and didn’t complain. The show went on. And so it does. The show goes on. It’s been a year full of wonderful events: my 60th birthday concert at London’s Wigmore Hall, and the party afterwards for 60 friends from around the world. A beautiful night in every way. The BBC Proms in the Royal Albert Hall just before that—performing Messiaen’s huge Turangalila Symphony in front of 6000 people (perhaps so far the most exciting performance of my life—and one which I also found profoundly moving). 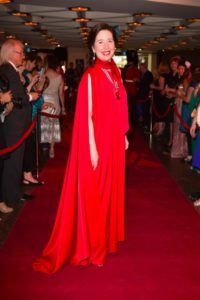 Receiving the Lifetime Achievement Award at the Governor General’s Performing Arts Awards in Canada, and walking the red carpet for the first time! Then there was another Trasimeno Music Festival, which, even though the work of organizing it practically does me in, is always a yearly highlight, and this year was no exception. Performing solo Bach in Perugia’s Basilica of San Pietro was moving beyond belief. Oh, but that was the second of two festivals in 2018—the first being in magical Venice at the beginning of the year. Four days of beauty and close friendship. Wonderful. The recording I did this month of Bach’s Six Partitas for Hyperion (the first one was twenty years ago) is important to me, and sums up all I have experienced in the twenty years since I first recorded them. And there was also a short holiday in Naples—perhaps the venue for a future festival? My heartfelt gratitude goes to the people along the way who have made it possible for me to go on. Without you, I couldn’t do it. We are social beings—we need that contact with people. I’m not like another Canadian Bach pianist who preferred to cut himself off from much human contact. No. At the end of 2018, I thank all of you for your great and generous friendship and support, and hope to see you again along the way in 2019!